Early this morning…sitting by an open window in the living room…everything outside was shrouded in dense fog. I was being kept company by the sounds of a solemn procession making its way overhead…the subdued and muffled whining and whirring of airplanes as they carefully made their approach into the Queen City to the north. Hundreds of people passing unsuspectingly over the silence and stillness below them. As I quietly read my book, another procession took place right outside my window. A steady stream of ruby-throated hummingbirds made their way to the feeder that’s hanging out on the porch. When one finished topping off its tanks on the sweet red nectar…another arrived to take its place. While reading, I didn’t even have to look up to know they had arrived. I could sense their presence just by the humming of their speedy wings…a sound more akin to that of a very large bumble bee. The feeder has three access ports, disguised as tiny, yellow five-petalled flowers. But, they all draw from the same reservoir that holds the red, sugary substance that the hummers love so much. So, I find it amusing that when each bird visits the feeder, they have to visit each of the three flowers in succession. Since I happened to be reading this morning about different spiritual paths, the birds’ behavior at the feeder seemed an apt metaphor for our own perception that, although we may see our own path as distinctly different from that of others, there is at the heart of each, an underlying unity and commonality. At one point…taking a break from my reading…I looked out at the feeder, and was met with a very strange sight, something I’d not seen before. There was a solitary hummingbird perched atop the metal support from which the feeder was suspended. Its wings were completely still…its head and long beak moving from side to side in apparent nervousness. Slowly getting up to take a look outside, I noticed a flash of reddish-brown amongst the grasses and shrubs. There was a very tiny deer nibbling on some leafy greens. It was a fawn still speckled with spots…and seemingly all legs. Then I noticed two more deer…yearlings from the look of them. Out of the corner of my eye I saw still more movement by the edge of the woods. It was a mature doe standing guard…mother keeping an eye on the youngsters. The yearlings grazed on grass and foliage for a good twenty minutes. 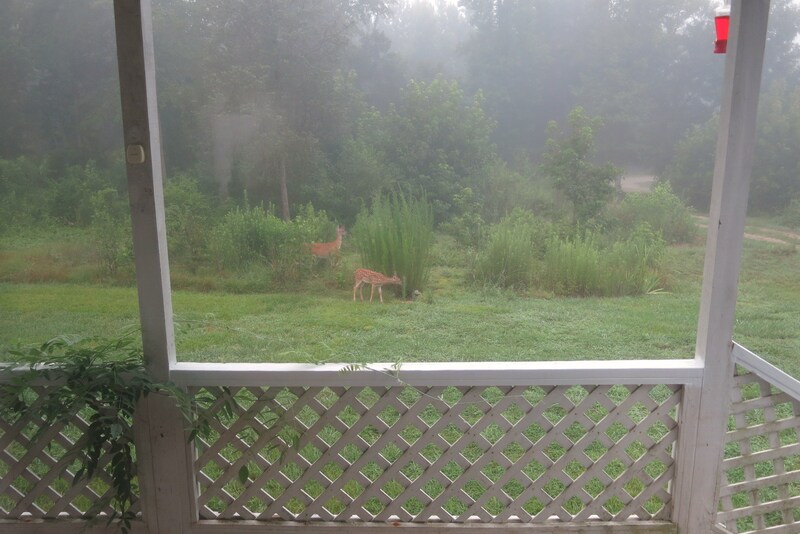 While its older siblings were eating, the little fawn leaped and pranced about, immensely enjoying itself on this fine misty Carolina morning. After a while…at Mom’s beckoning…they all darted off into the woods…but leaving me with a joyful sense of the sheer exhuberance of life…and gratitude for this brief early morning visit. The contrast could not have been greater. I spent the last week in the Los Angeles area…falling asleep every night to the incessant sound of traffic rumbling by on I-10…right outside my sealed-shut window. Sunday morning…I awoke to the sound of a yellow-billed cuckoo…with its soft rattle, followed by a frog-like thwump-thwump-thwump…a soft cool breeze wafting through the open window. Welcome home. On my flight back home on Saturday, I sat next to a 15-year-old boy who was traveling alone. He was sitting by the window. For the entire duration of the 4-hour flight, he kept the window shade down. Instead…he focused on either his cell phone…or his laptop computer…or both…completely engrossed in video games. Perhaps…an escape from the real world, where he was forced to commute cross-continent by himself? Towards the end of the flight, he put away his computer and phone…pulled up his hoodie over his head…and fell asleep. When we landed, he awoke and asked if we were in Charlotte. I replied, “Yes…Charlotte. Are you going on to Raleigh?” I wanted to make sure he didn’t miss his destination. He sleepily replied, “Yes.” He turned his head towards the closed window…back to sleep. Hopefully, there was someone waiting for him in Raleigh…glad to see him. I took my time on Sunday…catching up…slowing down once more. Silence…and solitude…was broken when an American Goldfinch came tapping on the window…not once…but twice… seemingly, peering in and welcoming me back. A strange and unexpected greeting. Remarkable…nonetheless. Pax has come and gone…leaving the Carolinas with a prodigious amount of snow and ice to clean up. It’s a strange name for a fierce winter storm. But…the world came to a halt for a couple of days in these parts…frozen in its tracks. Late this afternoon the clouds parted…and the sun appeared. The ice and snow-laden tree boughs began sloughing off their burdens…and the air was filled with the sound of water, transforming from solid to liquid with the help of a nearby star. Tonight is rather peaceful. The house is quiet…with a log burning in the fireplace. Outside…the bright moon is casting shadows on the snow-covered ground. Silence. 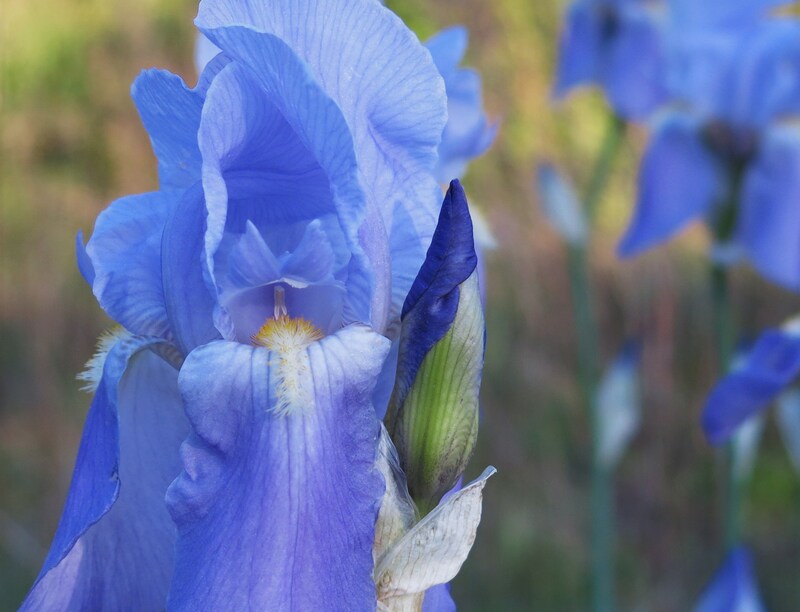 Coming across this poem by Mary Oliver, I was reminded that…It doesn’t have to be the blue iris that draws my attention…and humbles me before the handiwork of the Beloved. It doesn’t have to be the spectacular vision for which we’re always searching…the glorious sunset…the snow-capped mountain range. All of creation…even the very simplest of things…can be a beckoning that invites us into intimate conversation with mystery. There’s a phantom, silvery, three-quarter moon hovering above…silently, in the clear blue sky. And this below…which has inexplicably materialized in the last few days…out of raw materials of earth, air, and water. The closer I look…the more silent I become. The contrast between the brown haze of LA…and the clear Spring morning here in the Carolinas couldn’t have been greater. Leaving the frenetic traffic…and mentality…behind, it was good to get back to a world that is slow…and seemingly timeless. I’ve been spending the last two days winding down…back in silence…syncing up with local time. Sounds still pleasantly numbed from the roar of jet engines. The only movement being the sun as it creeps across the walls. The only sounds…those of birds. One bird’s song in particular has been haunting me…a plaintive, ascending trill that I can’t quite place. It reminds me of a similarly eerie upward spiral from the old movie The Time Machine. A warbler of some kind, I imagine…keeping me company for a few days as it passes through on its way north…taking a welcomed break from its long journey. Slow is good. There’s a gauzy, lace-like curtain in the window of my living room. The flowers that are woven into the curtain…while beautiful in and of themselves…obstruct the real view that lies behind the curtain. This morning, I was thinking how they’re a lot like our concepts and constructs of who…or what…we think God is. Some parts of the curtain are almost…but not quite…transparent, and offer a glimpse of the real world beyond. 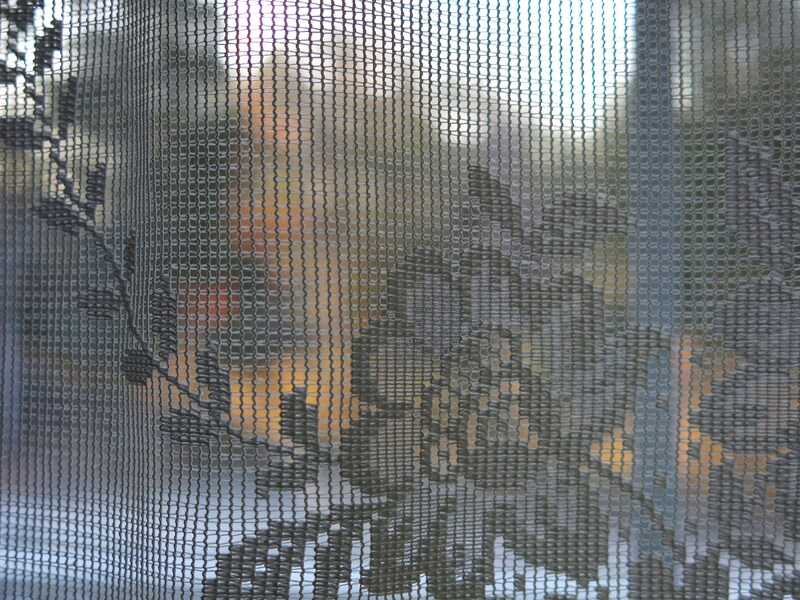 Other parts of the curtain…the interesting bits…like the lacy flowers and leafy vines, are quite opaque, and draw my attention from what lies on the other side. Sometimes…I like to gaze at the world outside my window through the closed curtain. It hides all the perceived imperfections and rough edges, imparting a soft and comforting warm glow to a world that, at times, can seem anything but completely benign. But at other times, when I’m feeling brave…I’ll draw open the curtains, tying them back on each side of the window with little corded loops…beholding the sometimes overwhelming beauty of an especially fine morning. Can we know God in this life? How do we go about knowing? Are we gazing at the little flowers and vines on the curtain…because they’re easier to apprehend and understand…our grand systems of thoughts and concepts that hold our attention, while the truth…the only truth…lies waiting in silence behind those wispy patterns that so intrigue us?